NeuroSpeculative AfroFeminism is a transmedia exploration told through speculative product design, emerging technologies, cognitive research, and transhumanism. Created by and for women of color, Hyphen-Labs presents a multi-layered possible future that transcends the constraints of the present; a realm which The New Yorker has called “another plane of consciousness.” Hyphen-Labs and its collaborators designed a roster of products—such as earrings that can record police altercations and clothing that thwarts facial recognition—thematically rooted in security, protection, and visibility. 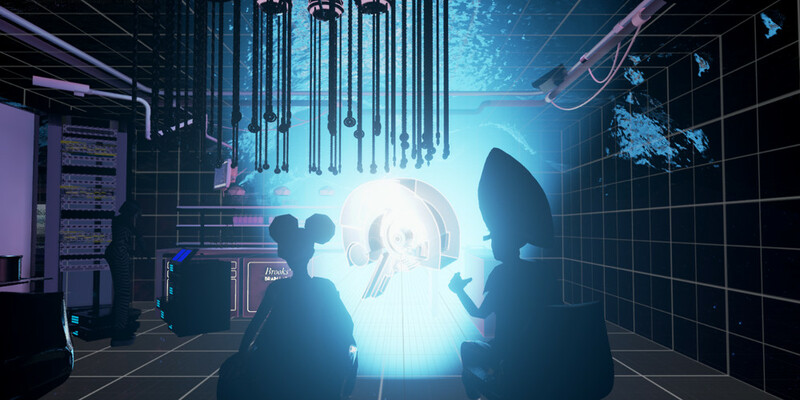 The virtual reality experience is the first chapter of a science fiction story placing you in a “neurocosmetology lab” where black women are the pioneers of brain optimization. Here, instead of ordinary braids, customers are fitted with transcranial electrodes that allow access to a surreal digital temple blending the physical with the digital. Additionally, participants are invited to contribute to ongoing neurological and cognitive impact research studies as a way of bringing scientific exploration into public spaces. Hyphen-Labs, an international studio specializing in the design of physical products, mixed reality experiences, and site-specific installations that influence the evolution of digitalism and technology. Hyphen-Labs creative director and co-founder, Carmen Aguilar y Wedge (US/MX) is a structural engineer, infradisciplinary designer, and artist, synthesizing design and technology to develop immersive transmedia experiences. Ashley Baccus Clark (US) is a molecular and cellular biologist and multidisciplinary artist who uses new media and storytelling to explore themes of deep learning, cognition, memory, race, trauma, and systems of belief. She is Director of Research at Hyphen-Labs. Ece Tankal (TR), co-founder, is a designer and new media artist interested in exploring interventions and interaction related to bodily, spatial, and temporal concepts through mixed media installations, virtual reality experiences, and speculative design. Nitzan Bartov (IL) is an architect, game-designer, and artist. She’s a co-founder of n-Dimensional game studio, and a member of Hyphen-Labs collective.